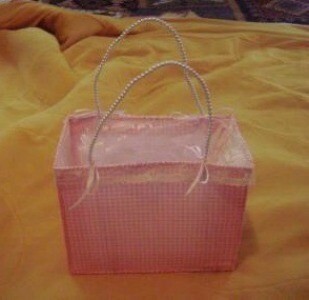 A purse made from plastic canvas. First, cut plastic canvas to the dimensions above (or any size you want). Then cut fabric to that size and sew it onto plastic canvas. Sew the pieces together to form a rectangular purse then sew lace or whatever inside for a liner. Sew on ribbon or whatever for handles, then tie ribbon on straps. What a cute idea and they would make darling Easter baskets for little girls! Thank you for sharing!